Everyone has them – that bruised, wooden coffee table or that tired-looking wooden vanity. We all have an old, bulky piece of wooden furniture that may have been in the family for years, and while the wood is still in great condition, its outer coat could use some remodeling. Here we will show a few simple steps to turn that two-door hand painted chest into a shiny new piece of furniture. In order to create a clear canvas to work on, you must rid your furniture’s surface of any old varnish, paint, or tiny imperfections such as scratches dents. You can use sand paper to rub everything off your wood, or you can use an electric sander to speed up the process if your piece of furniture is large. Once you are done clearing your canvas, the original wood of the furniture should be bare and read to be worked on. Take your polyester paint brush and dip it into your stain color which you have previously stirred to allow for even distribution of color. Once again, depending on the size of your furniture piece, choose a brush size accordingly. Stain wood with an even layer and access if you want to apply more layers after to darken the color. Usually three layers of stain give good coverage. If you want to add unique and custom touches to your furniture piece, you can use patina paint or bronze paint to add into the creases or edges of your furniture as highlights. 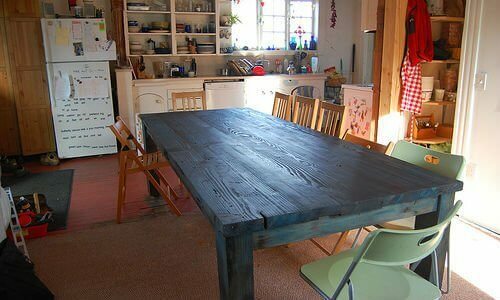 In the rustic table pictured above, you can see how the faint teal colored splotches across the furniture is patina paint or varnish. Apply wood varnish to the top of your table to seal in the stain and paint used when decorating. Allow it to dry for a day. Now you can enjoy your new piece of furniture, knowing that you resurfaced it yourself!